CMP Overview from Noria Corporation on Vimeo. Detect machine faults faster with the Condition Monitoring Pod. This multi-parameter inspection pod lets you quickly observe oil level, color and clarity, oil aeration and foaming, corrosion, varnish, wear debris and much more. You will quickly identify root causes and symptoms of failure that would have previously gone undetected. We've now made the CMP even better than before. Our engineers have redesigned its sight glass to incorporate the same super-tough Tritan™ copolyester as the Luneta Sight Glass. We also took the opportunity to add Viton™ O-Rings to both the corrosion indicator and the magnetic plug to ensure a consistent seal. Outdoor Compatible: UV-resistant & withstands long-term sun exposure. Not only does the 3-D sight glass enable quick inspection for water emulsions, foam, sediment and bubbly oil, it can be easily removed for cleaning. Capability without complexity. The built-in oil sampling valve lets you take live-zone oil samples without shutting down the machine. Because it's included, you don't have to purchase and install a separate sampling valve. Saves time and money. The included magnetic plug offers hands-free inspection. Dark oil? Just rotate the sight glass to move the magnetic plug above oil level or remove it for detailed inspection. It's quick glance condition monitoring at its best. 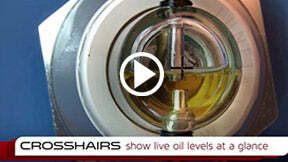 Need precision oil level monitoring? Crosshairs ensure you know exactly where the oil level stands and makes what could be a vague inspection parameter much more accurate and streamlined. Now you can easily spot corrosion and varnish issues that would typically require opening the machine. The included inspection rod provides quick confirmation of corrosion suppression of oil-wet and non-oil-wet surfaces. Remove the inspection rod to access the oil for your field tests like water contamination, dielectric constant, oil temperature, viscosity, blotter, surface tension and more. A quick syringe sample enables a variety of tests. One of the CMP's many features is its ability to quickly pull an active oil sample using a simple laboratory pipette or syringe. The sample can then be applied to a variety of field instruments, such as the FluidScan shown in the video clip above. The FluidScan is a portable infrared spectrometer that quickly analyzes many oil properties, including oxidation, water contamination and additive depletion. These portable instruments and field tests allow early detection of abnormal machine and lubricant health conditions to optimize predictive and proactive maintenance alerts. Will a magnet at the oil level be able to pick up ferrous wear particles? Yes. Even though ferrous particles are more likely to sink than float, testing of the CMP has proven that the effects of both oil viscosity and turbulence will suspend wear particles so that they can be easily captured and viewed by the CMP's magnetic plug. What machine port hole diameters can be used with the CMP? 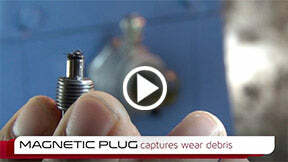 You may use additional bushings to expand the thread diameter but not to reduce it. Reducing the diameter will cause errors in oil level measurement. What if I need additional CMP parts? If you need additional parts not shown online please contact us directly and we will be happy to assist you. Why would I need a Copper Corrosion Indicator? Corrosion can result in chemical damage to machine surfaces including cupric metals like copper, brass and bronze. When this happens there is no easy way to determine the onset of corrosion within your machine, risking catastrophic failure. The Copper Corrosion Indicator will tarnish when these abhorrent conditions exist, providing an early indication of a corrosion. This enables corrective action to be taken before irreparable damage occurs to the machine. How does the CMP detect varnish? The CMP comes with a Steel Corrosion Indicator (a Copper Corrosion Indicator is also available). If varnish is observed on the Corrosion Indicator through the Sight Glass, this is an indicator of a current or potential varnish problem. Varnish on the Corrosion Indicator = Varnish on the Inside of your Machine. Is the oil in the CMP representative of the oil within the machine? The CMP Sight Glass provides a visual inspection of the oil at the oil level. Oil level observations are an excellent way to inspect for foaming, discoloration and wear particles. A Sample Valve with a pilot tube is also provided with the CMP. This Pilot Tube can be placed deep within your machine below the oil level for live zone sampling. How often do I need to clean the sight glass bowl? The CMP should be cleaned whenever the Magnetic Plug and Corrosion Indicator are unable to be seen through the Sight Glass when rotated out of the oil. Can the CMP be used with a pressurized system? Pressure testing the CMP is currently underway. Is the CMP compatible with synthetic lubricants such as polyalphaolefins (PAO) and phosphate esters? The materials used in the CMP are compatible with mineral oils and most synthetic lubricants (e.g., PAO). Certain synthetics, such as phosphate esters, may exhibit marginal incompatibility. When in doubt it is recommended that compatibility be confirmed by contacting the lubricant supplier or performing compatibility tests in the laboratory. Will the CMP leak if the oil sump is overfilled causing the sight glass to be completely filled with oil? In normal use the CMP will not leak if filled above the oil level, however it is not recommended that this be a standard practice. This is also dependent on the tightness of the CMP threads and use of thread sealer. How far below the oil level should the tip of the pilot tube be located? 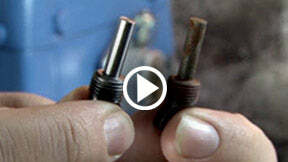 The Pilot Tube tip should never rise above the oil level during standard operating conditions. If this level is not known then it is best to bend the Pilot Tube as far down as possible without interfering with internal machine components or hindering installation. Can the CMP be exposed to direct sunlight? Yes, the CMP can be exposed to direct sunlight. Can the CMP be exposed to high pressure washing? The CMP can be exposed to high pressure washing but it is not advised to spray the CMP directly with wash fluids at close range. Can the CMP be exposed to common detergents and other chemicals mixed with water in high pressure washing? Compatibility of the acrylic sight glass and elastomers used in the CMP should be confirmed. Will the CMP sight glass melt if the oil gets very hot? The CMP can withstand extreme heat. It would take temperatures exceeding 320°F for the Sight Glass to begin melting. Can I install the CMP without lowering the oil level in my sump first? Yes it is possible but not advised due to the amount of oil that might be lost and the associated hazard of leakage. How often should I inspect oil conditions through the CMP? We advise daily inspections of the CMP for early detection of problems with the oil and machine. 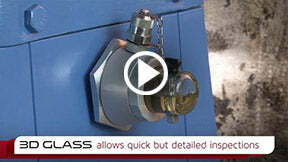 Won't the threaded ports on the Sight Glass be potential contaminant entry points? We estimate that at least ninety-five percent of the inspections of the magnet and corrosion indicators can be done without exposing the oil to the atmosphere (e.g., visually through the sight glass). The only time the magnet or indicator needs to be removed is when a real issue has been observed (as viewed through the sealed sight glass). If such an issue exists, either related to a problem with the oil (e.g., varnish or loss of corrosion suppression) or the machine (e.g., abnormal wear), we believe that early detection commands a far higher premium than a minor and temporary exposure of the oil to atmospheric contaminants.